Location: Spring Green Prairie Preserve north of Jones Rd. This was a mid to late morning visit. I hiked the trail to its end at the top of the bluff. 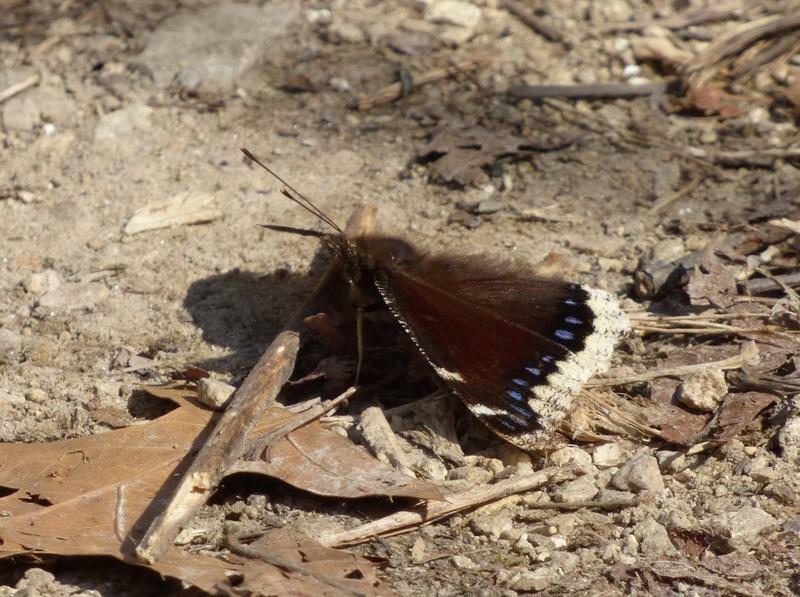 The Mourning Cloak was in the woods on the back side of the bluff. 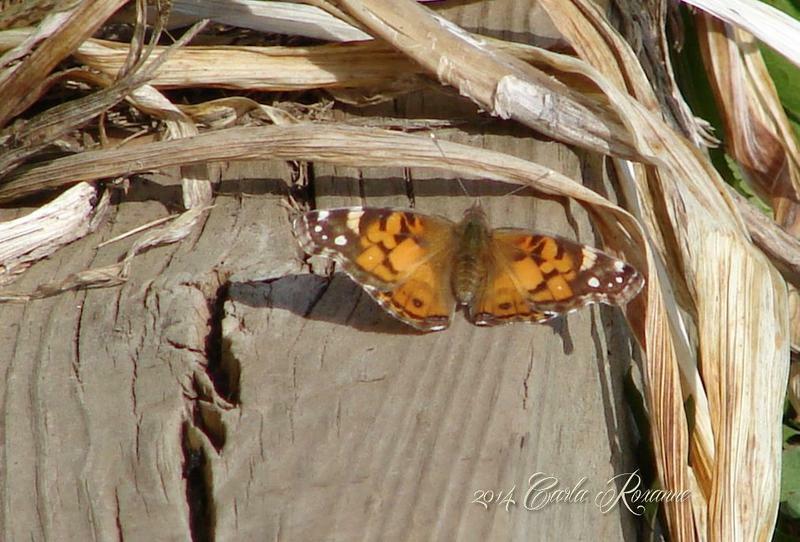 My first butterfly of 2014! 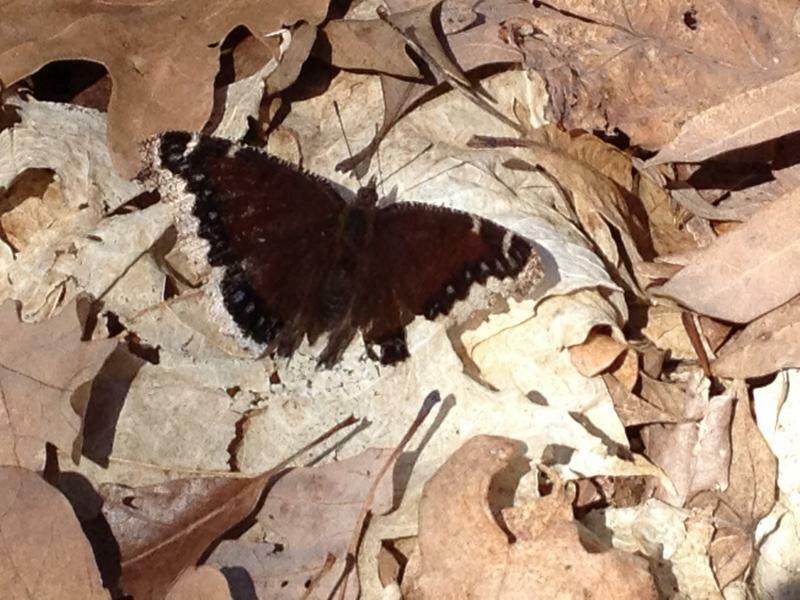 Mourning Cloak sighted in backyard sunning itself in wooded area, by black oak and weeping willow. Sunny, breezy day. 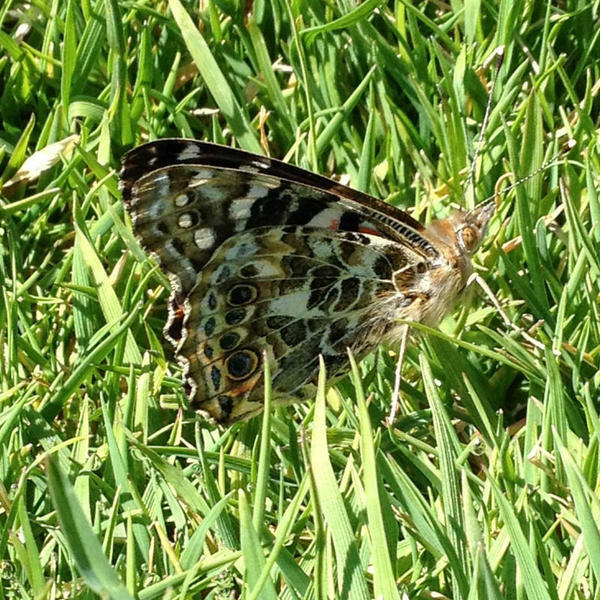 As I was watching birds, I walked into a meadow area and a butterfly flew up from right in front of me. 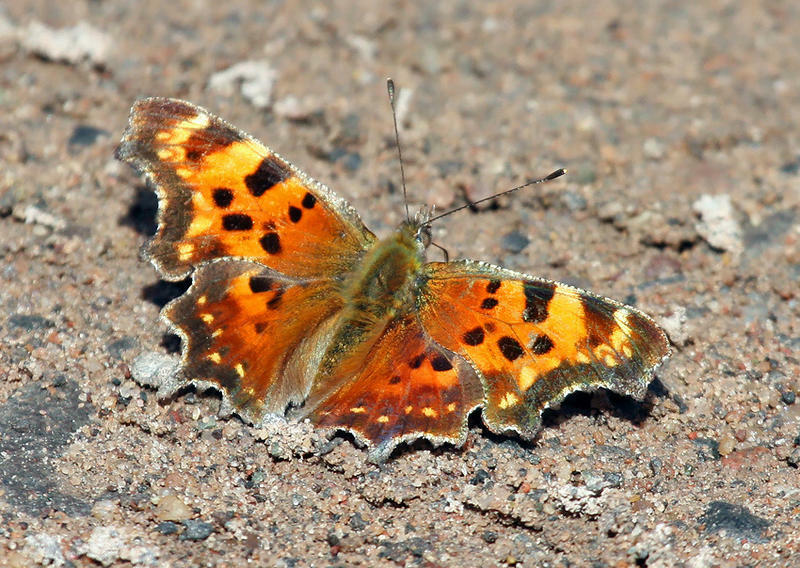 I immediately could see that it was a comma species due to the small size, orange and brown marking above with dark spots, and the brown mottling below. I suspected Eastern Comma, but I wasn't sure, so I got closer. I was able to verify it as an Eastern Comma. 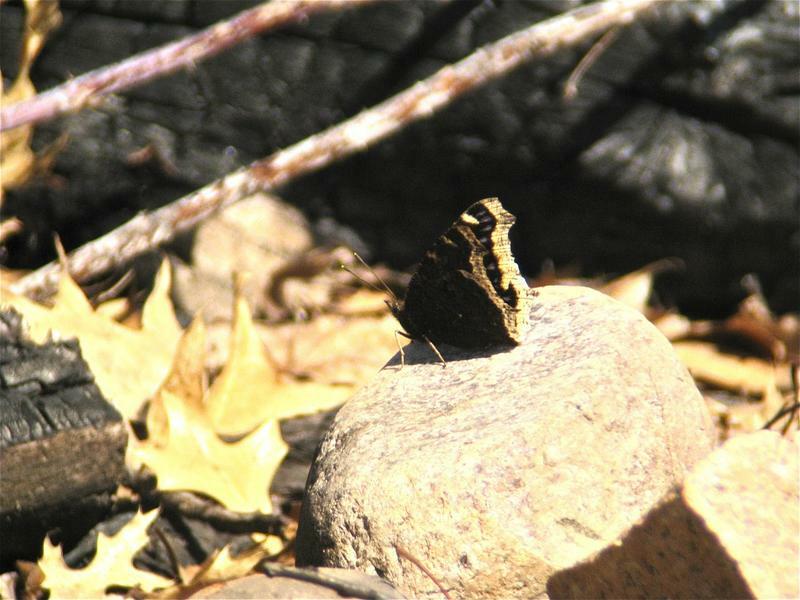 Later in my hike, I flushed another butterfly up that was obviously a comma, but it did not land so I couldn't identify it. 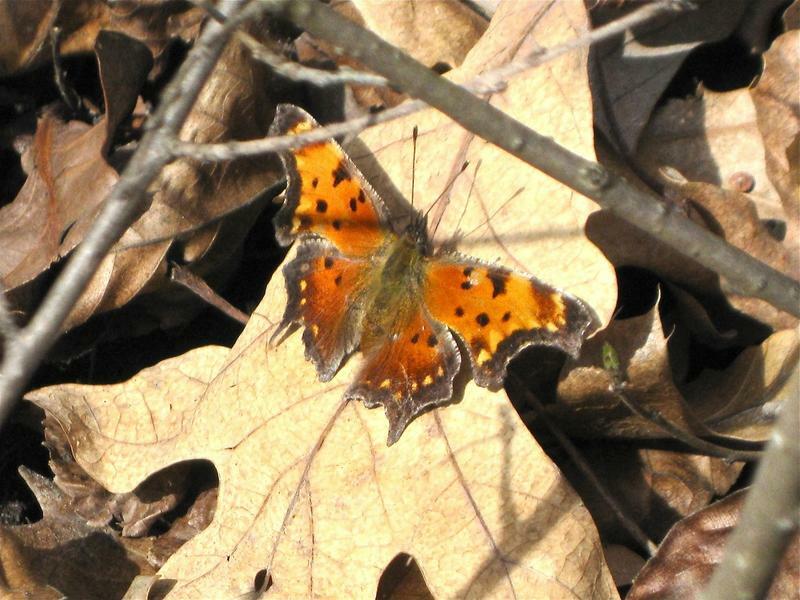 Later and in a different place, I saw another comma that I was able to verify as an Eastern, and then a little later spotted another comma that flew away before I was able to identify it. In total, I saw 4 commas, 2 of which were Eastern Commas and the other two unidentified, but were almost certainly Eastern as well. About 60˚ F. out with a fairly strong wind from the south and sunny. 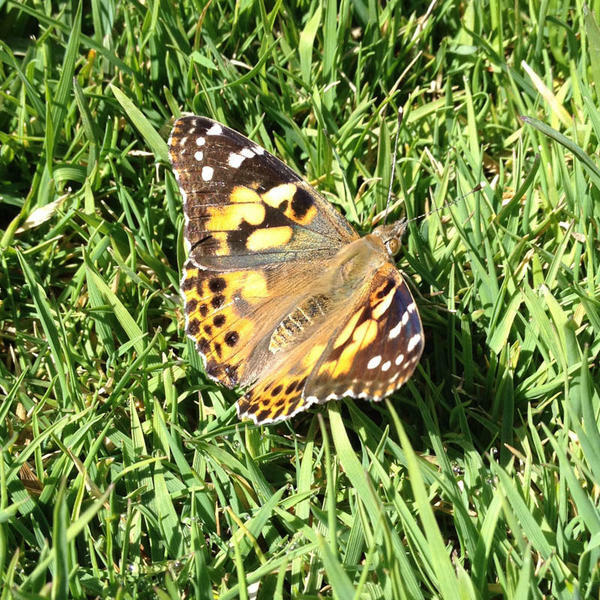 Our first backyard butterfly of the year. It flitted between the bird feeder and this barren, windswept plateau looking for the perfect place to sun itself. 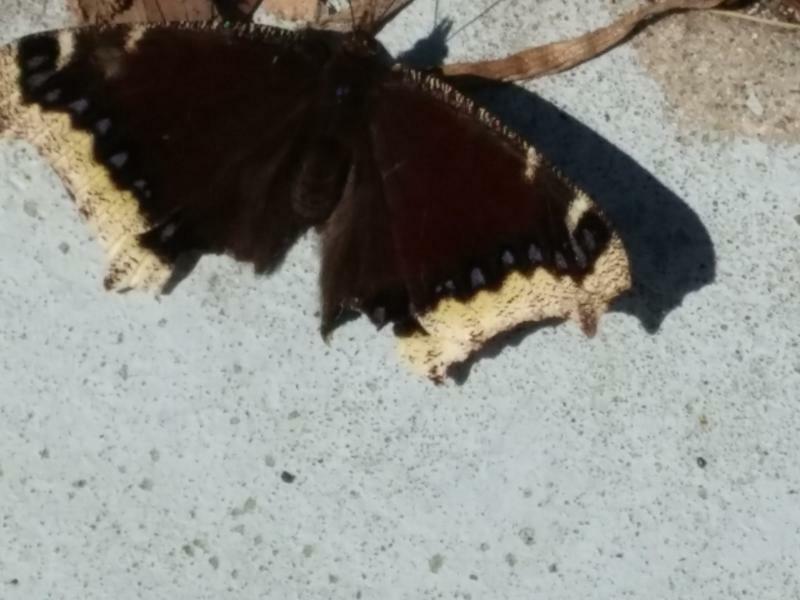 My first butterfly of the year! 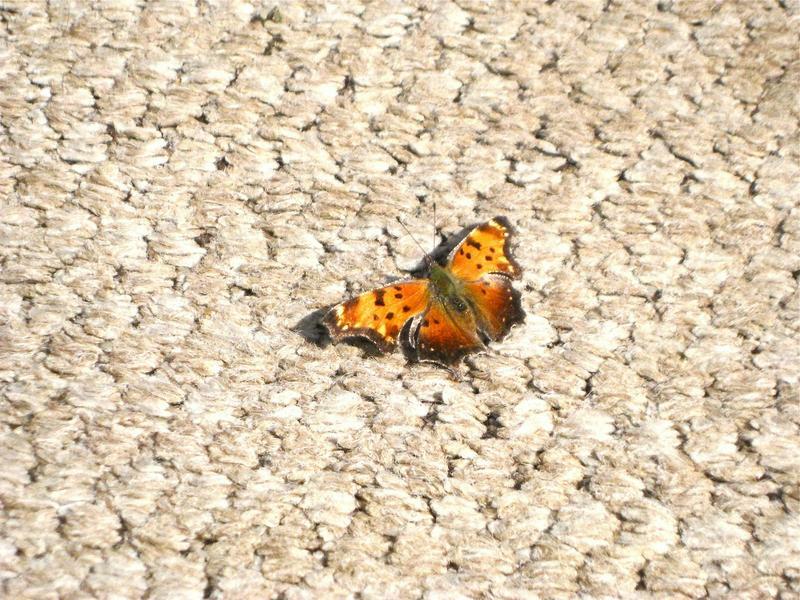 I glanced out the window and noticed a comma sitting on an old rug that we put outside yesterday. The rug warms up very quickly, so the comma was warming itself on it. I had seen a comma yesterday that I only saw briefly, and I think this is the same one. 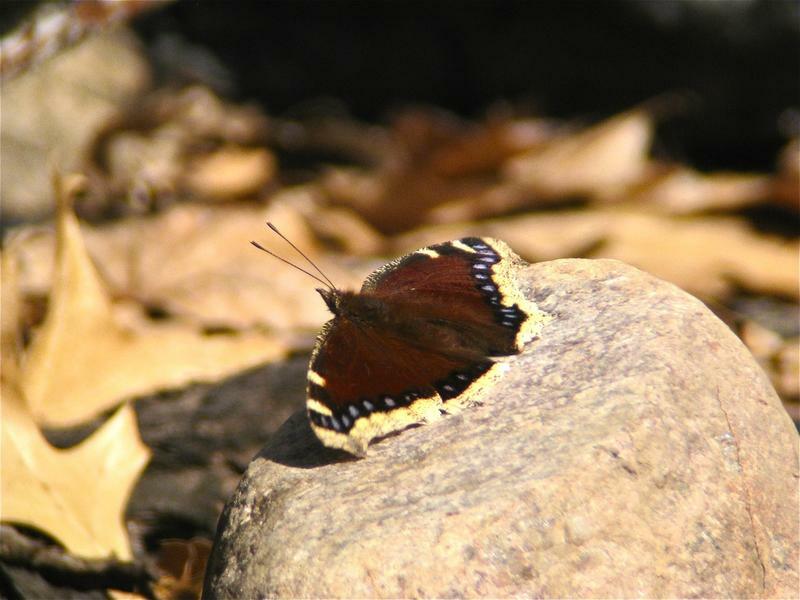 Fluttering around in the late afternoon, finding sunny spots to rest. Yea! 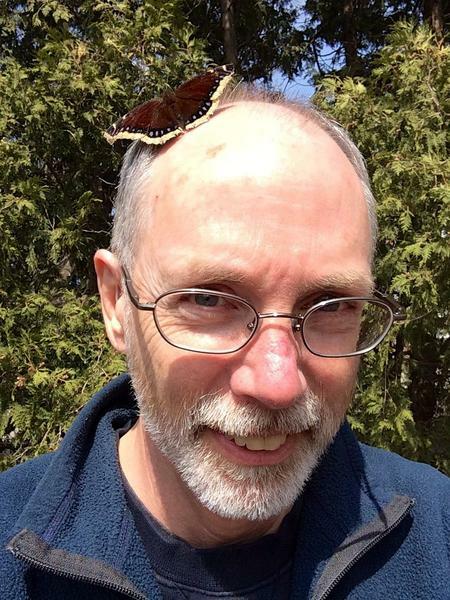 My first Wisconsin butterflies for this year. Two of the Mourning Cloaks I saw separately. Three I saw together flying in circles around each other (amorously?) All moved too fast for photos. 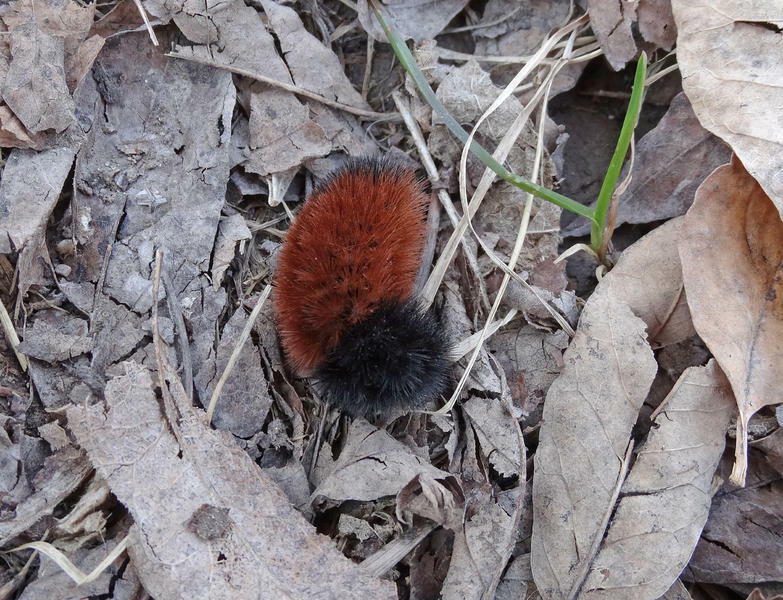 Also saw a cute Wooly Bear Caterpillar and a Garter Snake. Lovely spring morning. Location: Mud Lake SWA along Tollefson Rd. Same corner of the yard, every year, like clockwork. This was not our latest first sighting (Apr 13 in 2008). 62° and Sunny. 11:45-1:30 PM. 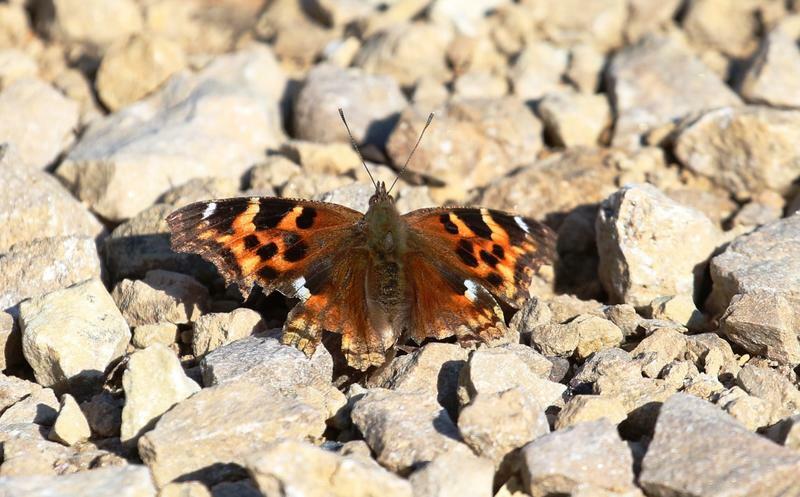 Saw one other butterfly that was probably a comma. 64° Sun > Cloudy. Both were sucking sap on a boxelder stump. 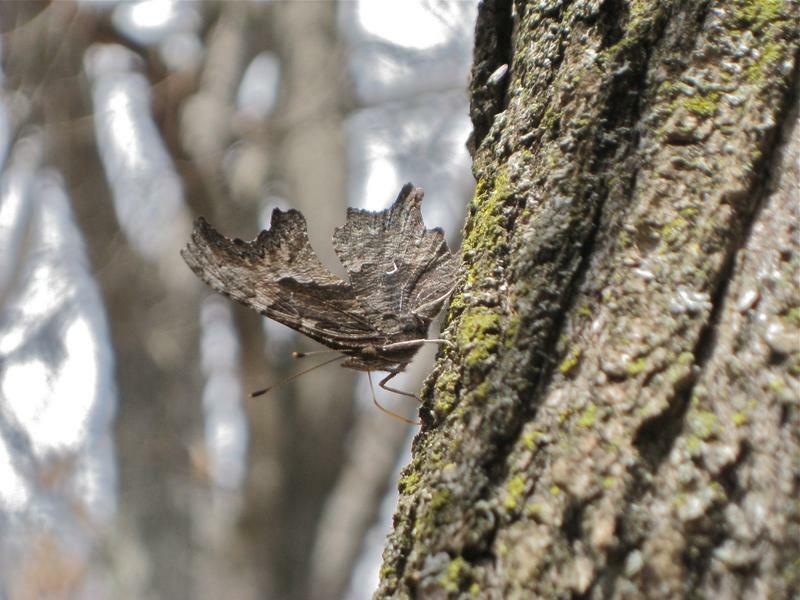 A reminder that the Mourning Cloaks and anglewings that survived our long winter are emerging from hibernation hungry, and have only tree sap available. 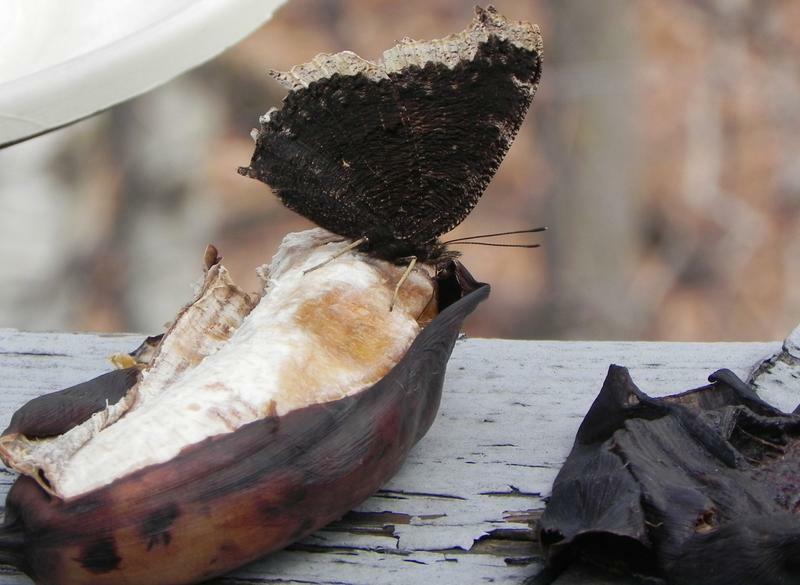 They love overripe fruit. 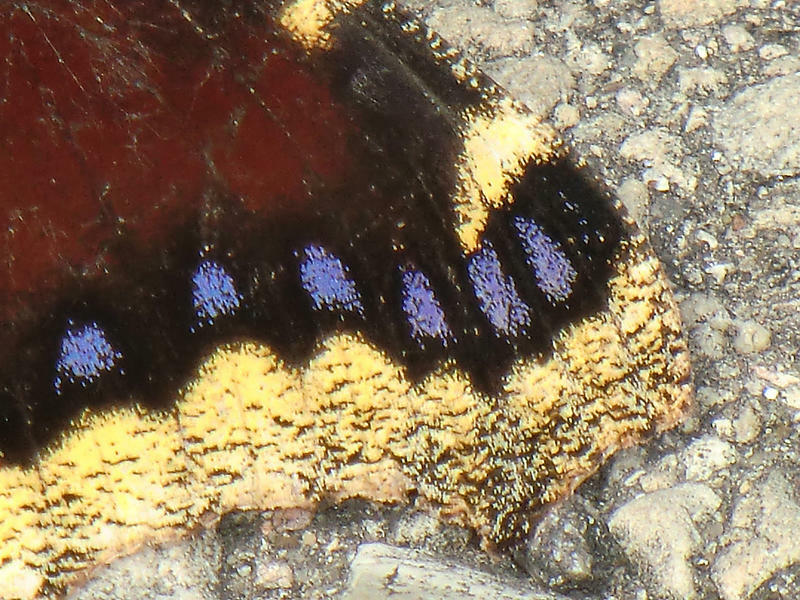 This Nymphalis antiopa passed by around noon, sunned itself on the pavement for several minutes, then flew away. 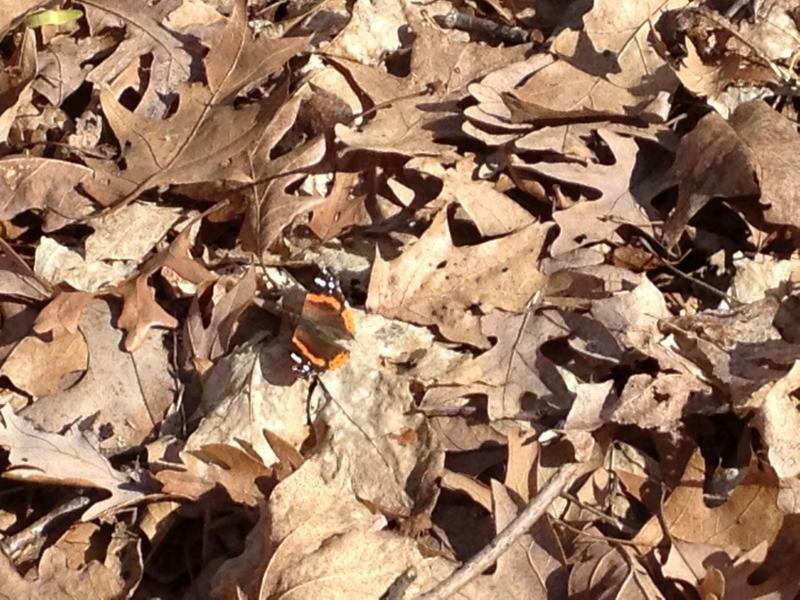 My first butterfly of the year. Sadly, I didn't have my camera. 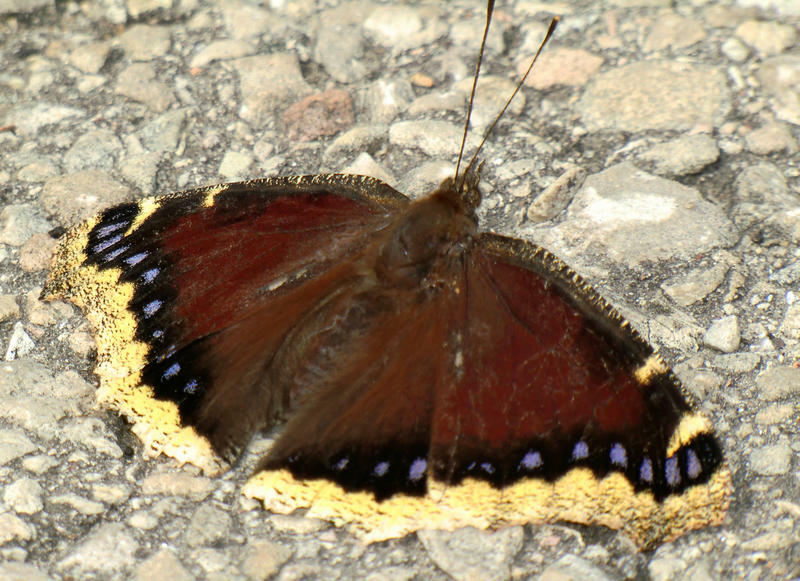 The Mourning cloak was flitting about on a country dirt road. 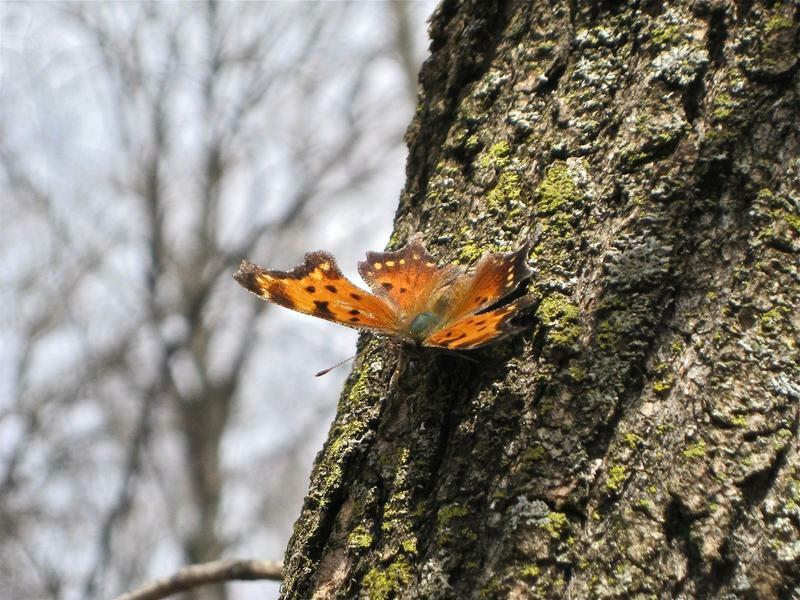 I was walking through our woods and noticed a comma sunning itself on the bark of some trees and sometimes flying to the ground to sun on the leaves. 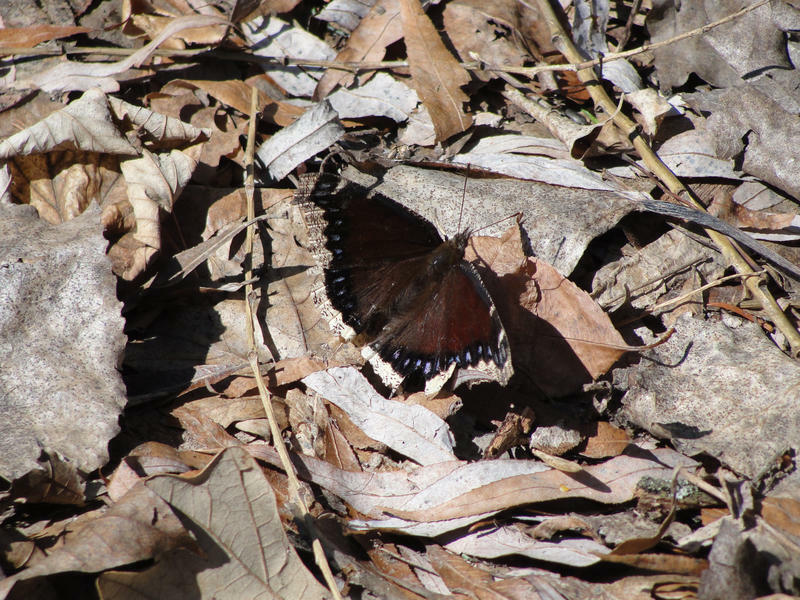 I got closer, and could tell that it was a Gray Comma (probably the one I saw the other day), so I continued to watch it. In a few minutes, I saw that another comma flew in, and after close inspection, realized it was a Gray Comma as well. Realizing that this is the highest count for me in Rock County (maybe the highest count in this database?) I went inside to get the camera to get some photos. After coming back out, I saw that they were still there and I photographed both of them extensively. I have included some of the photos in the checklist. I will have to watch the commas closely this year to see if this is going to be a good year for Gray Commas. 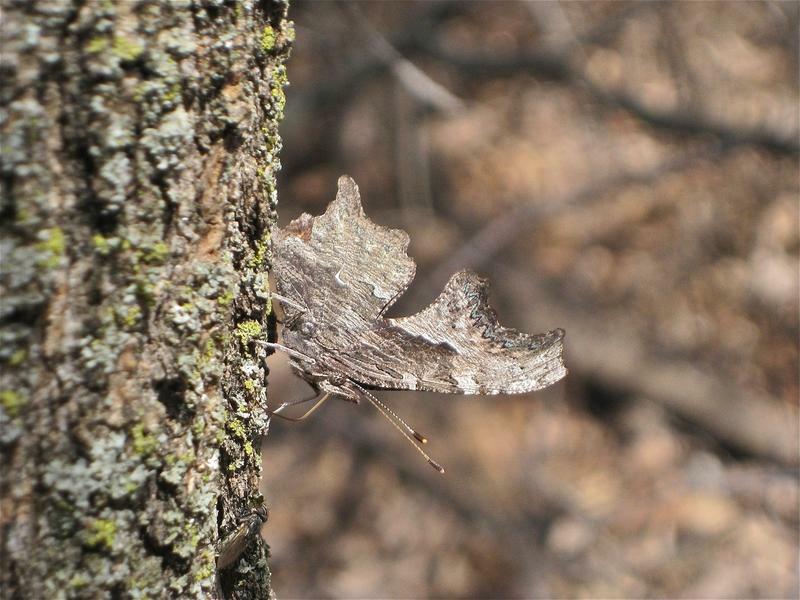 I was out birding and noticed these butterflies. 60˚-65˚f. out with a slight breeze and sunny. 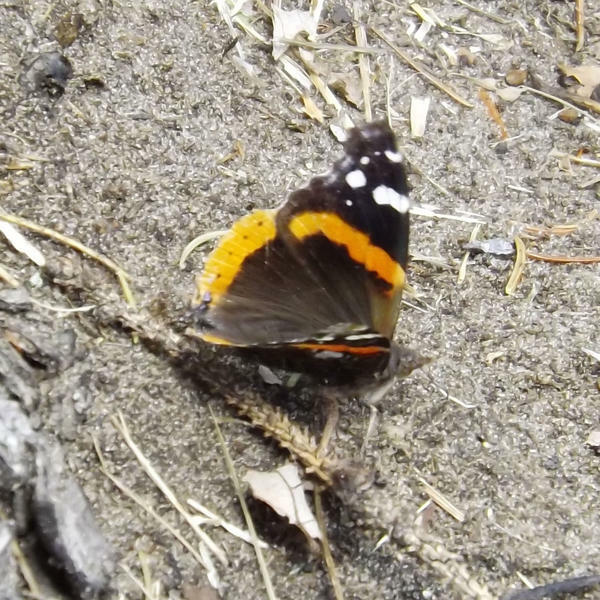 I was surprised to see the Red Admiral, and he was flying around too fast to get a photo of him. 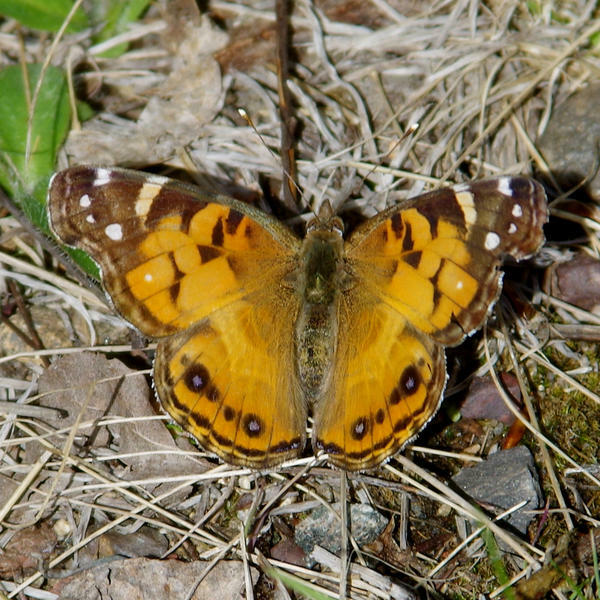 It is my first butterfly of the year. It was nectaring on blue scilla, one of the few non-natives in my yard. It was a cold 51 degrees and the sun not very warm with the cold wind off the lake. 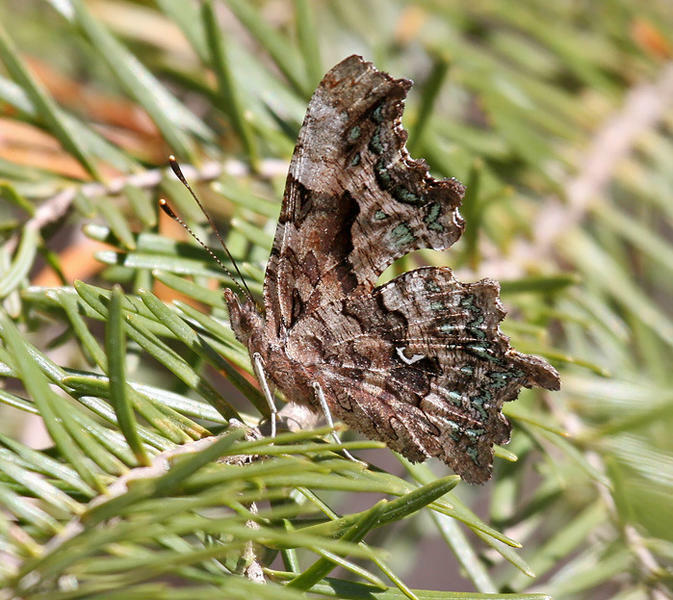 Possible Red Admiral sighted here about a week prior. 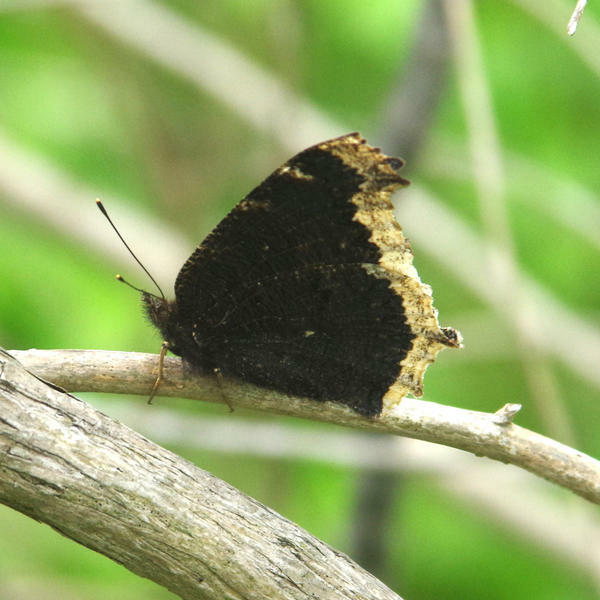 It was warmer and there were Morning Cloaks, and an occasional Red Admiral flying and checking each other out. Finally, my first butterfly of the year! 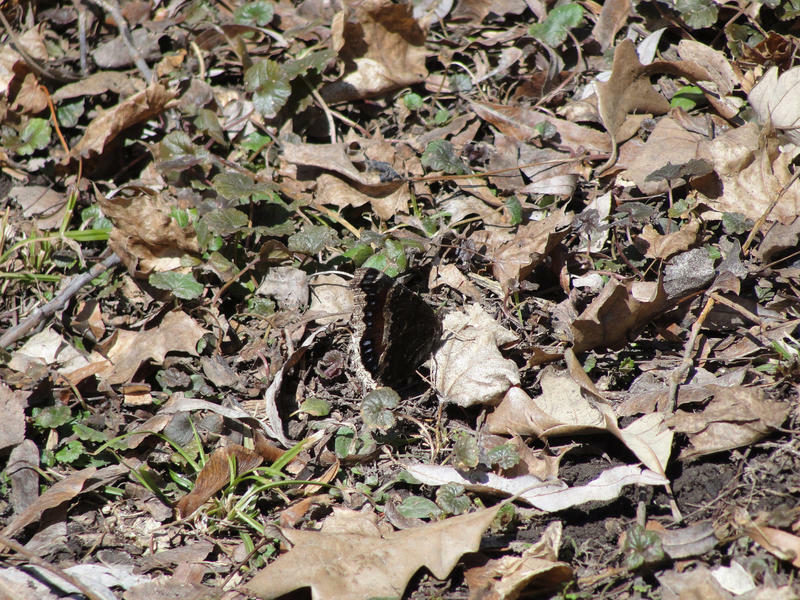 First butterfly of the year, alighting on the ground and flying about in the trees. Most of the snow gone on a warm sunny day. 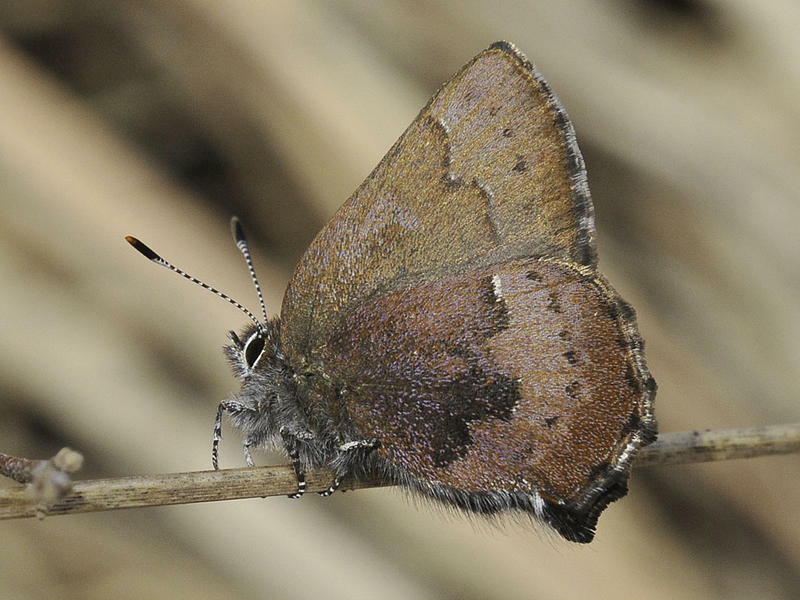 Lots of snow yet but a few butterflies aloft. Had three more unidentifieds in addition to those reported here. 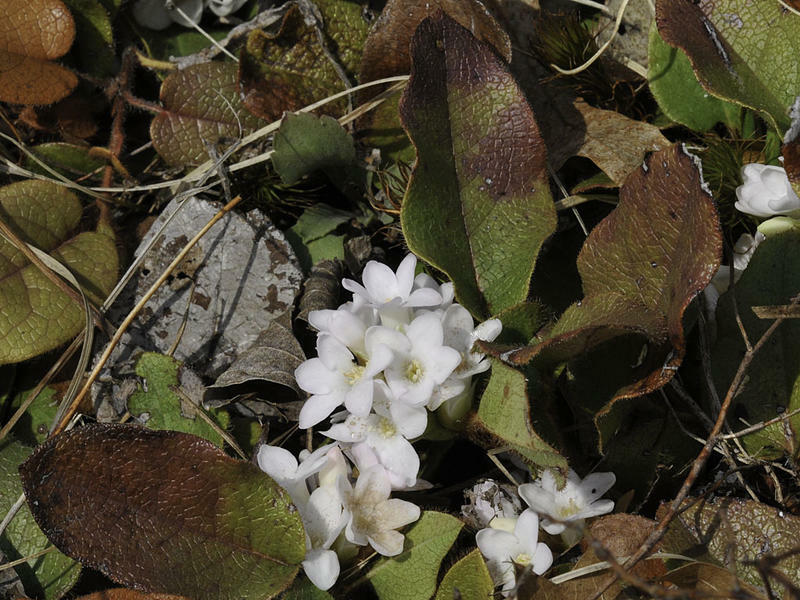 Annual trip to look for Trailing Arbutus and my first elfin. Found both! 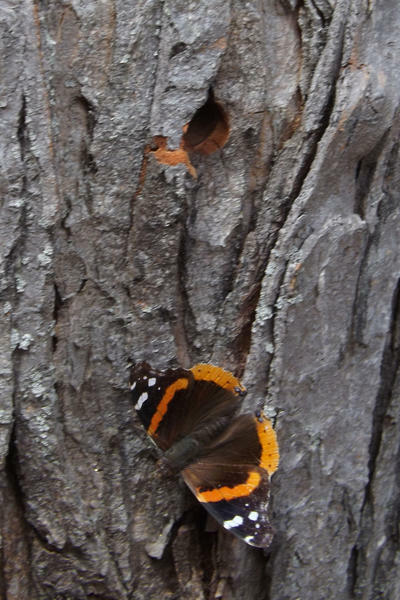 One Red Admiral was visiting a bleeding sap hole from maple sugaring, tap had been removed seven days earlier! Steady restless flight atop lawn. Bright and sunny. Noon. My first of the year. 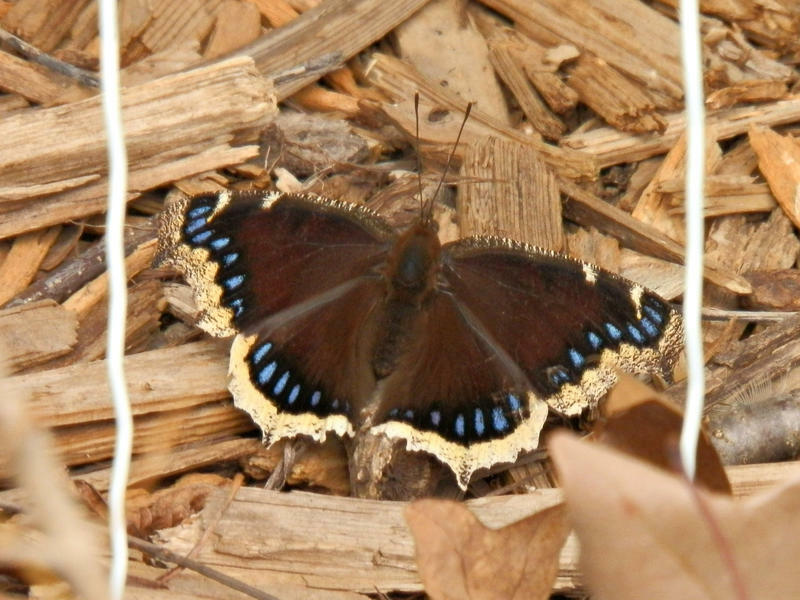 Mourning Cloak was sunning on the trunk of crabapple tree, around 1:25pm in the front yard of our house. I saw this 'Spring' Spring Azure while watching birds.